During a meeting with a student delegation from the School of International and Public Affairs at Columbia University, which focused on the latest political, global and regional developments, Ashrawi provided graduate students with a comprehensive assessment of Israel’s egregious violations and the United States’ unrelenting campaign to provide Israel with continued legal, political and financial cover. “Israel’s impunity and total disdain for international law and consensus have been emboldened by the current US administration’s disastrous policies and punitive measures against the Palestinian people and its collusion with the military occupation,” said Ashrawi, according to WAFA. 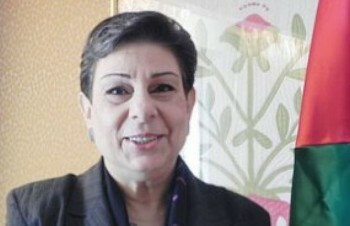 At the end of the meeting, Ashrawi answered the visiting delegation’s questions on the internal situation and the importance of genuine reconciliation and elections, the necessary role of Palestinian women and youth in the political system and future collective moves in the international arena.